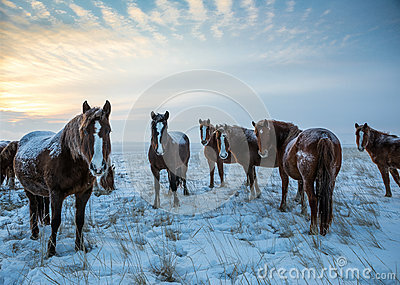 Horses in the steppe, Altaysky district, Ochury Village, Khakassia, Siberia. Couple of horses are grazing in boundless Kazakhstan steppes. Horses. Wild horses against the blue sky. Horses in the steppe. Pets graze in the spring steppe.